Ajanta: Door from Caves II and IV. bl.uk > Online Gallery Home	> Online exhibitions	> Asia, Pacific and Africa Collections	> Ajanta: Door from Caves II and IV. 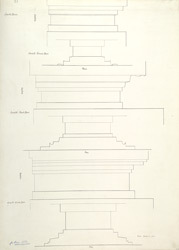 Illustration of doors from Cave II and IV at Ajanta from James Burgess' 'Original Drawings from the Buddhist Rock Temples at Ajanta.' The Buddhist cave temples of Ajanta were excavated into a horse-shoe shaped cliff overlooking the Waghora River in the 2nd ? 1st century BC and later in the 5th century AD, a period of time which coincides with the Hinayana and Mahayana phases of Buddhist art. Cave II is a monastery from the late 5th century which has preserved some remarkable paintings. The verandah is supported by pillars with fluted shafts ornamented with floral bands. At both ends of the verandah there are small shrines with a seated Naga king with yaksha attendants on the left and Hariti with a child on the right. The ceiling of the verandah is painted with floral and geometrical designs. Cave IV dates from a later phase of excavations from the late 5th Century and is the largest monastery at Ajanta. It consists of a columned verandah with two cells at either end of the verandah. The hall is entered through three doorways, the central one is decorated with divine figures, guardians, couples and Buddhas.